I attended a very interesting event at Chelsea Football Club on 21st May organised by the West London Collaborative – a new, independent organisation that is working with West London Mental Health NHS Trust to enable service users, carers and staff to work together in equal partnership to design, deliver and evaluate services following co-production as a way of working. It was held at CFC because the lead organiser – Jane McGrath – grew up locally and the collaborative felt it was important for the conference to be rooted in the community as the focus was “Asset Based Community Development” ABCD. A wonderful artist team documented the two days, providing a picture board of the discussions. 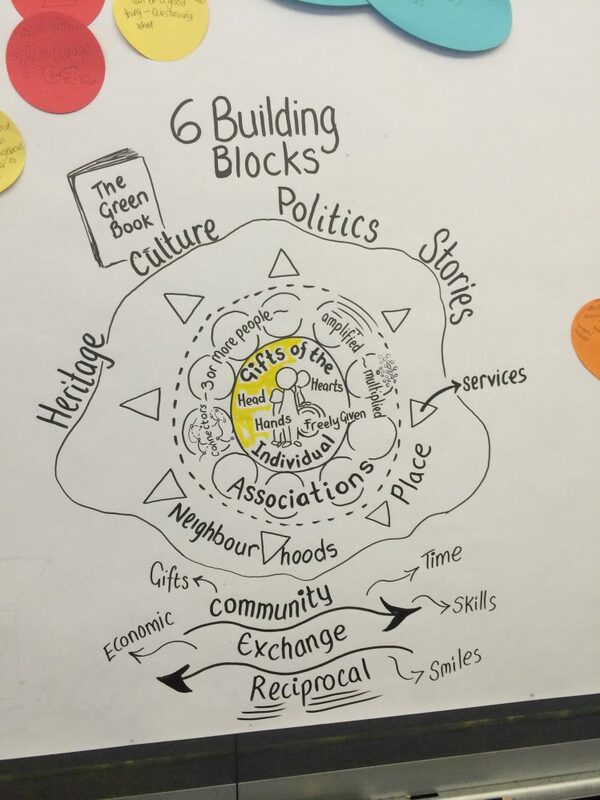 Here is one section describing Cormac Russell’s 6 building blocks for ABCD. I was not able to stay for the whole of the two-day event but I came away inspired by the event. There were so many senior health managers from North West London (board members, commissioners, CEOs, clinical leads) alongside service users and carers. The collaborative was in action with leadership and member engagement. Alongside this the focus of the day, that of having #my mad idea and sharing it with others for the benefit of our community was positive and energising. In groups, we discussed ideas for developing community life where everyone’s gifts are valued. I heard of a street where on Sunday afternoons the road is closed so local kids can play, supervised by all the community young and old which has nurtured new neighbourhood friendships. A man explained that this was a central conversation for mental health care providers because services are not a proxy for a life – people want an ordinary life. I had been invited to the event because McPin have been working locally on a Whole Systems Integrated Care project to co-produce a new way of working to support people with long term mental health needs living in the community. The solution we have co-produced with local service users and staff – The Wellbeing Network – encompasses many of the themes I heard discussed at the event. The next stage is implementation and we so many local leaders present to hear about ABCD this conference might have made that task slightly easier! The one aspect of the event that was challenging was Cormac Russell’s assertion that best practice is the enemy of better practice, and that he was enormously suspicious of models, including theory of change models. As a researcher, identifying components of models, understanding the mechanisms and exploring experiences within them is important. That is research work. I think the message was never settle for the best, always seek to deliver differently to engage more people with incremental improvements in practice so that people on the edge of community life can find a place. At the McPin Foundation we wish the West London Collaborative all the very best and hope they can plan some other inspiring community events in the future.